"Bring visually impaired children in disadvantage opportunities to approach the comprehensive and appropriate education helping them develop all potentialities, and gain essential knowledge and skills to independently attain happy life and social integration." Braille characters are presented in a vertical rectangle including six embossed dots that can be recognized by touching with the tops of our fingers. Previously, reading and writing of the blind were unimaginable things, moreover, learning opportunity for them was a far-distanced dream. That time, the blind’ letters were embossed to be touched with different ways such as carving on wood, cutting letters with thick cloth to needle on paper, or assigning the piece of wood together to create letters. Those methods were all expensive, cloggy, inconvenient and, importantly, impossible for the blind to make by themselves. Moreover, reading such kind of letters was very slow and difficult. However, everything has changed since Louis Braille invented the special embossed Braille characters system in late 1820. Being blind in an accident at the age of three, Louis Braille (1809 – 1852) was actually an intelligent and studious French boy. He had a wide range of ideas and knowledge but this knowledge was blocked and it let no blind come in. He tried to find the key to open that treasure for himself and other people. Once Braille declared to his parents that “The blind are the most miserable people in the world. To know about an event, they can only use the ears and hands. Besides, they may rely on books but until now, books for the blinds have no value. It is a must to find ways to help the blind to quickly approach the characters on paper. There is a way for the blind to read by hands as easy as by eyes that the normal people use”. This was also an ambition that Louis spent most of his time pursuing. Even when becoming a teacher and a famous organist, Louis Braille still did not give up his idea. Once hearing that captain Charles Barbier invented new way of delivering information in the dark thanks to embossed dots and lines on thick paper, Louis learned, did some research and finally built a so-called character system with small embossed dots, which were easily made on paper and could present all the letters, complex math symbols or music. Time went by, sometimes it seemed that his invention was sank into darkness because of human jealousy. However, thanks to God’s blessings, it had a chance to prove its importance to everybody and to be accepted as an irreplaceable means of educating blind students since 1895. To commemorate him, people built a statue named Louis Braille in Pathéon Palace, where remembered all names of the French brilliants, They also use his Braille’s name to call this alphabet system. The Braille alphabet came to Vietnam and was made to be familiar to Vietnamese since 1898. Braille alphabet can be written by using board and a stick or can be typed on Perkins machine. If we print book, first, we compile files on computers, then, we use MATA Braille Translator software by Thien An Shelter and connect to Braille printer to print them. 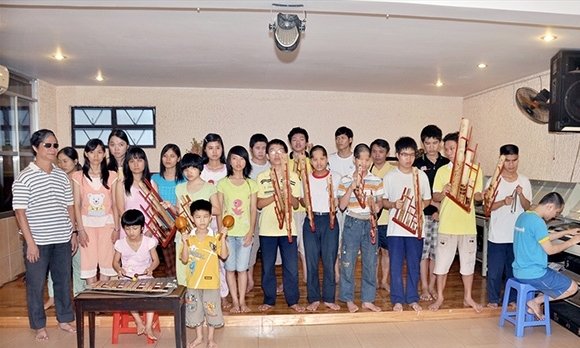 Since the established day, Thien An shelter has determined the important role of Braille book in educating the blind students and soon equipped Braille printers thanks to the help of those who have the heart of gold. Nowadays, the shelter has developed a small print plant, being able to supply learning and reference material demand of the students and do many making-Braille-book projects for other schools. This job brings an amount of compensation, contributing to satisfy some basic needs, studying fee for the students to be took care and raised in the shelter.